Rainsmart 50mm Nero pave allows to create a Permeable Grassed surface for parking or driving. Nero Pave provides a high load bearing capacity upto 235 t/sqm while protecting vegetation root zone from compaction. 95% internal void ratio and 3D openings means more space for root development and stormwater infiltration. Rainsmart Nero pave cell structure provides a protective casing around the grass nodule making grass regeneration quick and efficiently. 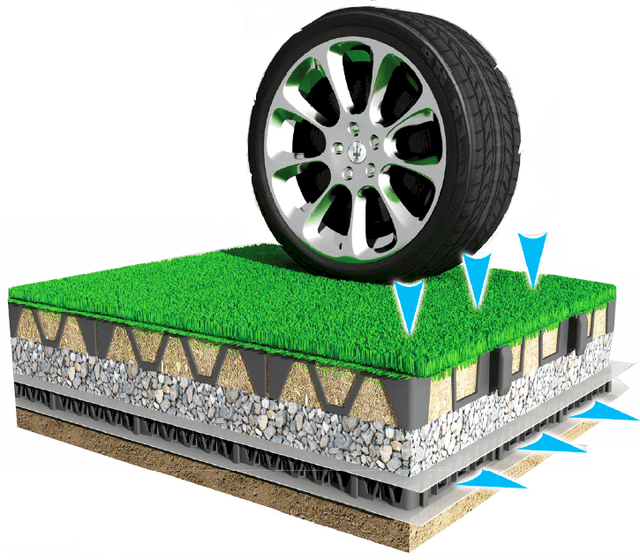 At the same time provides protection for the root zone from compaction due to Pedestrian and vehicular activities resulting in a naturally looking vegetated surface. Surfaces installed with Nero pave can reduce or eliminate the need for traditional stormwater structures reducing costs and regulations. Porous surfaces reduce run-off, increase groundwater recharge, and improve quality of stormwater discharge.